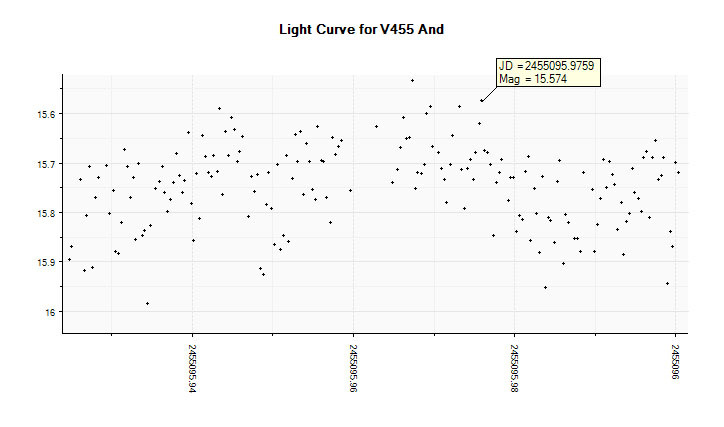 This is a time series of observations of a dwarf nova cataclysmic variable in the constellation of Andromeda (V455 And). The observation was taken over a 4 hour period, consisting of two 110 min. series separated by a 15 break. Viewing conditions were fair. The accompanying image shows the star field with the V455 labeled as "V" and the two comparison stars marked as "C1" and "C2" that were used in the initial data reduction. A subsequent data reduction was done using different comparison stars, with better results.